Wow! There you have it. So now do we have your attention? 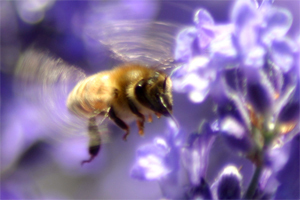 Now we know you have heard lots of times that bees are on the decline and we are not here to bore you with the whys and whatnots of that. We simply want to share with you our Top Ten bee friendly plants to include in your garden which look great, are easy to look after and importantly, bees just LOVE. So next time you are down the garden centre or browsing online why not get yourself some of these beauties and know that you are doing your bit to keep the food on your plate? 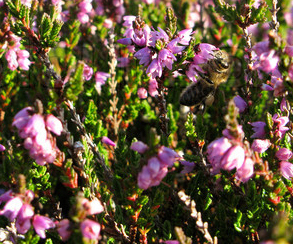 First of all bees love diversity so make sure you have a few different options for them and also ones which are flowering at different times of the year to encourage them to keep coming back. Secondly, go for native plants wherever you can and ones which will thrive in your conditions. 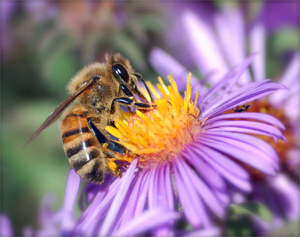 The more bees you attract into your garden the better your garden will grow too as many plants and vegetables rely on pollination. A favourite with so many of our clients. It loves dry, sunny positions so if you don’t have the correct sort of soil in your borders consider having a pretty pot filled with lavender on a sunny corner of our patio where you can enjoy the sights, smells and buzzy sounds from it! 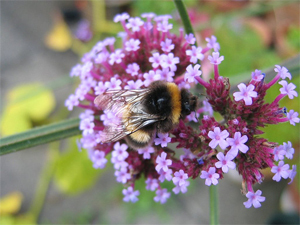 We love verbena, particularly verbena bonariensis. It grows really easily, even in our heavy clay soil and gives statuesque height to the border. You may need to give the plant a bit of support if your garden catches the wind and be warned, this plant does like to self seed. It provides beautiful winter interest if it’s not cut down in Autumn. Nepeta is loved by cats and bees alike! It is similar to lavender with its pretty flowers and silvery blue leaves and gives off a lovely aromatic scent as you brush past. Another favourite in our garden and one which grows really easily and provides great structure to a mixed border. We love the dark red colour which appears late Autumn when the garden is starting to need a little bit of a boost and continues to provide interest through the winter. It’s easy to split and create new plants so if you know a friend who has some then go ask for a piece now! Bees love all thistle-like plants and it’s hard to choose from the array of wonderful, architectural plants. 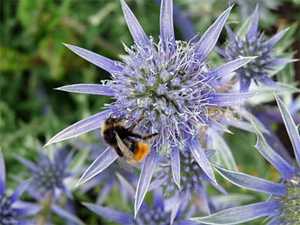 We love eryngium big blue but there are many beautiful varieties to choose from. Eryngium is another great plant for winter interest if you don’t cut it down after it has flowered. 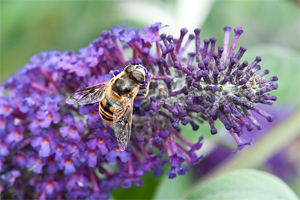 Probably best known for attracting butterflies but bees are also partial to a buddleja. The long cone-like flowers prove too irresistible for them. Hebes are a great structural shrub which can be a lovely alternative to buxus in your garden if you are looking for a rounded shape to provide an interesting form. 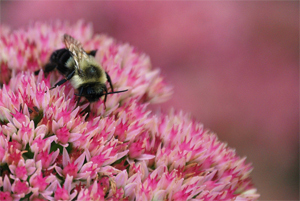 But bees love their flowers too making it a well rounded (excuse the pun) plant for the garden. 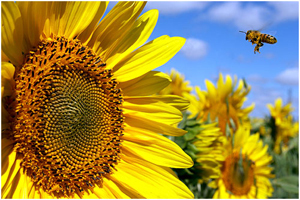 Now, who can resist the big yellow smiley face of a sun flower? It’s the perfect plant to get kids involved in gardening. Get them to have a competition with their friends to see who can grow the tallest plant and use it to explain to them the importance of encouraging bees into the garden. 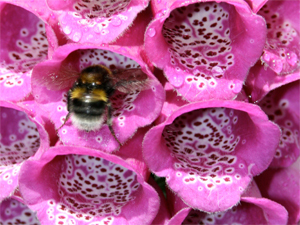 We regularly see foxgloves growing profusely at the sides of the road so it shows just how easy they are to grow. They will self seed furiously so once you have them you will get free plants forever. Bees just love snuggling up inside one of the bell like flowers and having a nice big feed. Again, a plant we often see growing in the wild in Scotland and if you have acidic soil in your garden you will be able to grow these well and keep our fuzzy friends happy. If we have whetted your appetite, then there are literally HUNDREDS of plants* which bees will love and there will be plenty to suit your garden and soil. 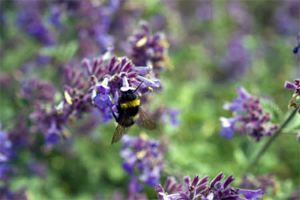 The perfect for pollinators list published by the RHS gives you more information than you could ever wish for. 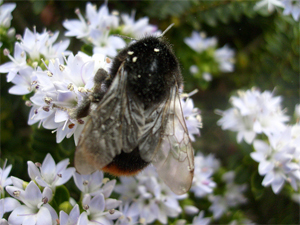 If you want any advice on creating a bee or wildlife friendly garden please get in touch. * Honourable mentions also go to echinops and fennel. Both of these statuesque plants are magnets to bees as well as being stunning plants to add some height and structure to a garden. You need a decent amount of space for these though.